The Safari Hat underwent some changes on the beta. Players will need to add it to the Toy Box feature before being able to use it. Its function remains unchanged and you can still "equip" it, however it won't replace your helm slot on use. Instead, you will simply receive the bonus pet experience gain buff and the Safari Hat will visually be placed on your character's head. No more worrying about putting your gear back on after a hard day's work of pet leveling! Here are some additional notes on the Safari Hat. The buff and hat graphic will persist through zoning into different areas and logging in and out. "Show Helm" option has no effect on the Safari Hat as it's no longer actually in your helm slot. Currently, to remove the hat you need to manually click off the buff. 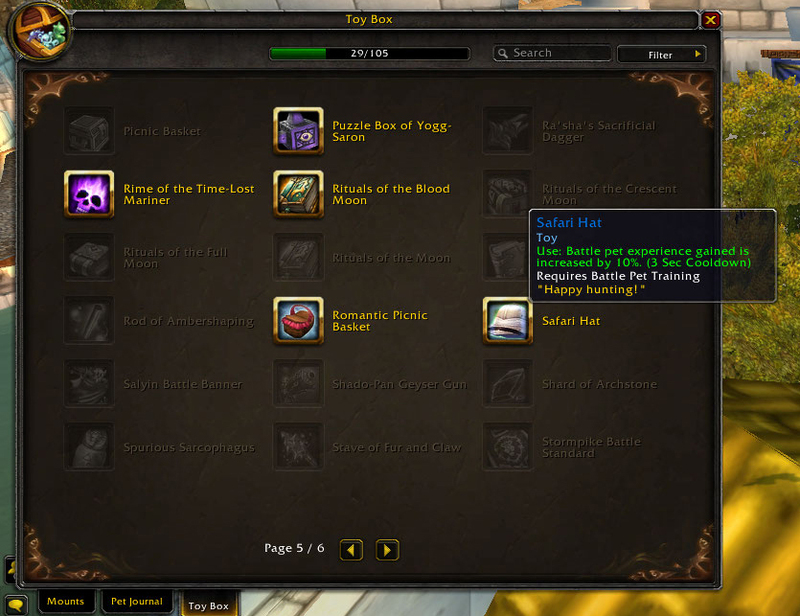 The Safari Hat is still a work in progress and the Toy Box continues to receive updates and improvements, but the prospect of being able to proudly wear our Safari Hats in WoD without the fear of not having the right helm on is definitely exciting. Last week LeCraft provided yet another teaser of a possible pet coming in WoD. This time it's a Sea Calf! You may remember this creature from the Howling Fjord daily during WotLK. This familiar hairy seal can also be found in the Dread Wastes at Soggy's Gamble. For a preview of what a pet-sized version might look like, head over to the Timeless Isle and say hello to Allie, Oriana's companion. LeCraft revealed that the Sea Calf might come from fishing. It's anyone's guess where we'll have to cast our lines or nets, but perhaps the Sea Calf will simply be lured to our sides by the scent of freshly caught fish. Don't know which is worse, realizing you just did a raid with the Safari Hat or reallizing those last twenty leveling pet battles you were wearing your fighting hat. I tweeted LeCraft and asked about the recently datamined Mini Flying carpet. He said they will try but it may just be a vanity pet. I am totally okay with that. I don't play my tailor much, I would love for my main to be able to have a mini carpet following me around lol. Well at least it is in the Pet Journal. I hope Blizzard will tread the Fishing Hat, Cooking Hat and Fishing Pool the same way. Bitter sweet. 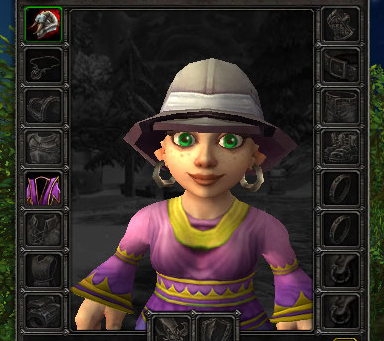 No helm transmogs, however I won't go into a raid wearing my Safari Hat and wonder why my DPS is down. And now I'll never see any of my helm transmogs again.